The topic of EAS or Electrophilic Aromatic Substitution reactions is one that covers a key reaction pathways studied in the average organic chemistry course. While the mechanism undergoes a broken pi bond and addition to the former sp2 carbon atom, the EAS reaction is very very different from the Alkene Addition Reactions you’ve studied back in Orgo 1. The video below will give you a quick introduction to the EAS reaction. Also, you will see a comparison to the alkene addition reaction and explanation of the super-electropohile. 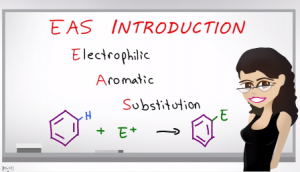 This is Video 1 in the Electrophilic Aromatic Substitution Video Series. Click HERE for the entire series. Glad to help. are you taking a summer orgo course Mjay? glad to know this is helping you. Are you in a summer course or finishing your spring semester? You’re welcome. Which topics are you studying right now? Thank you so much for those kind words and I’m really glad I was able to help you get through orgo 1 with confidence. Are you working on a summer Orgo 2 course or preparing for the Fall?